This article is a short summary of Mario Party 10. 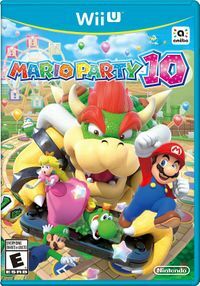 Mario Party 10 is a 2015 Wii U party game, and the tenth main installment in the Mario Party series. The game is centered around the new Bowser Party mode, in which one player is able to play as Bowser for the first time in the series against the other players. At launch, copies of this game were bundled with the Super Mario series Mario amiibo, which was originally only available with the bundle. Later, in September 2016, Nintendo would release a set of two additional bundles: one with the Super Mario Peach amiibo, and one with the Super Mario Bowser amiibo. Three parties to play, including amiibo Party! For up to five players. Bowser chases Team Mario around the board! Play as Bowser, and dominate Team Mario. Team Mario keeps away from Bowser. Play minigames and collect Mini Stars. Put your amiibo figure in the game! Over 70 new minigames and many extras! You can crash the party as bad guy Bowser™ in Mario Party™ 10! Challenge your friends and tease your frenemies in 3 great party games in 1. Be the bad guy in the brand-new Bowser Party mode to playfully antagonize your buddies. Play with at least one amiibo™ to unlock the inventive amiibo Party mode. And have an all-around blast in Mario Party! Mario Party 10 has tons of fun ways to play with, challenge, and triumph over your friends, with 3 modes and a wealth of exciting goodies. Strategies your way around a variety of unique boards–like Whimsical Waters and Chaos Castle–to win Mini Stars and best your buddies. In Bowser Party mode, you can take on the role of Bowser to mess with your friends' game. And amiibo Party mode–unlocked with use of at least one amiibo–adds a whole new level of strategy to the Mario Party series by letting you customize amiibo with unique Tokens. Need to let off some steam? Challenge your friends to a bunch of exciting minigames, unlock bonus content, and more. Mario Party 10 features three main modes for play. The first is Party Mode, similar to the gameplay of Mario Party 9, in which four players travel together in a car toward the end of the board, defeating bosses and collecting as many Mini Stars as possible to win. The second of these modes is Bowser Party. In this mode, one player, using the Wii U GamePad, controls Bowser to eliminate the other players (using Wii Remotes), who travel in the car as a team and must reach the end of the board in order to win. The team of players rolls one dice block each, while Bowser is able to roll multiple dice at once and can even re-roll. If Bowser catches up to the other players, then they must play a Bowser Minigame, during which the players must try to avoid Bowser while he tries to attack the other players and reduce their health to zero, in which case they are eliminated. Players can also pick up hearts in place of Mini Stars across the board to increase their health. The third main mode in the game is amiibo Party, which requires at least one compatible amiibo figure to access. In this game players control amiibo figurines as game pieces on a game board, moving around a small board and collecting coins to obtain Stars in a similar manner to other Mario Party games. Players are also able to upgrade their amiibo figures. Several smaller minigame modes are also available, such as a set of bonus minigames, Minigame Tournament, in which eight characters face each other in minigames to progress to the next round; Bowser Challenge, in which the player must play through all ten Bowser Minigames as Bowser to take as many hearts as possible; and Toad's Room, in which the player can view extra content. Mario Party 10 Wii U (Nintendo Selects) EU: September 30, 2016 A re-release of the game under the Nintendo Selects banner. This page was last edited on 8 October 2016, at 18:05.